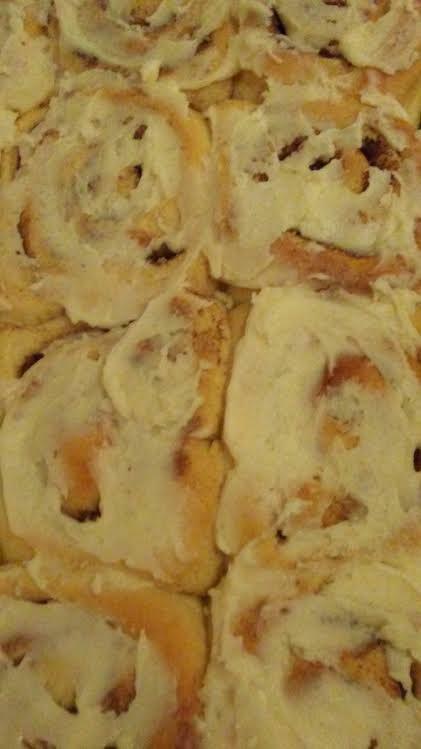 #FoodReview My Mom's #Homemade #CinnamonBuns!!! Nothing says love than my Mom's homemade cooking which includes her Cinnamon buns that she uses only the best flour (usually King Arthur's), vanilla, cinnamon, butter, brown sugar, eggs and other ingredients to make, roll, rest and rise, and then bake in her oven!! 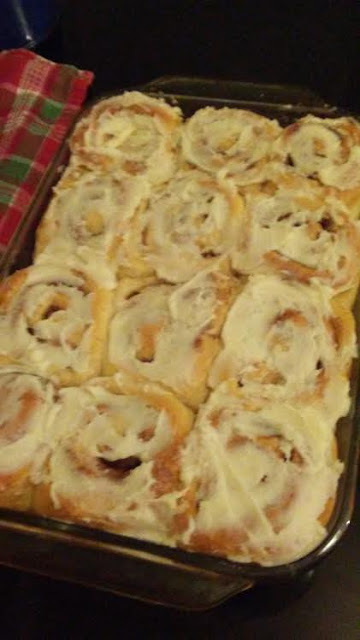 Then she makes her homemade icing to spread once the rolls are room temp and it doesn't take long before family and friends discover this delicious goodness!! One roll is the size of your hand and fill you up til lunchtime!! My Mom made two batches so everyone can have roll to enjoy!! I hope someday that I will be able to master yeast rolls so I can continue to family tradition!! They look great-- do you have a favorite recipe online?